This entry was posted in code additions, codes, news on April 9, 2019 by Alice Allen. This entry was posted in code additions, codes, news on February 5, 2019 by Alice Allen. This entry was posted in code additions, codes, news on January 4, 2019 by Alice Allen. 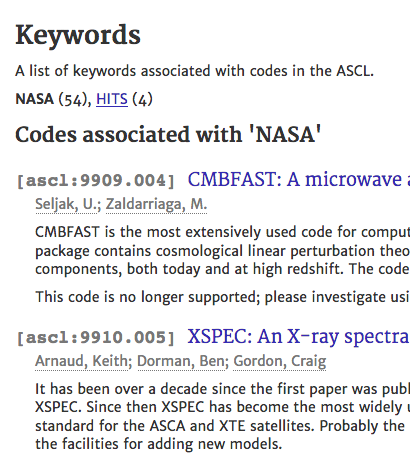 The ASCL makes it easy to cite the software astro research depends on. 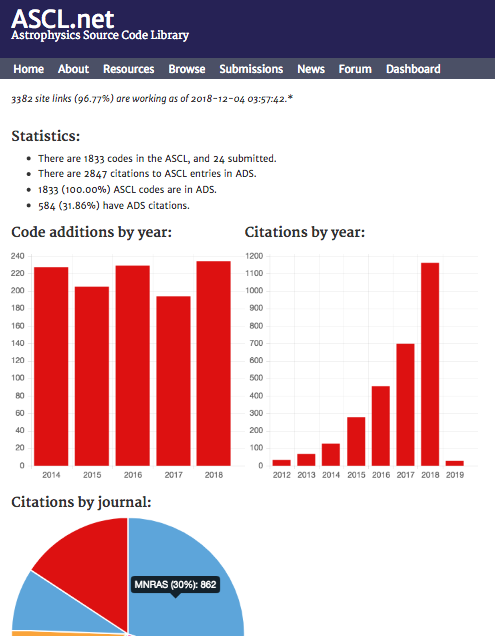 Every astronomy journal and many others such as Science and Nature accept ASCL references; ADS shows citations to ASCL entries from nearly 90 journals. Citations to ASCL entries are tracked by ADS, Web of Science, and other indices. ADS makes it easy to search for software in its holdings through the use of the “software” doctype. 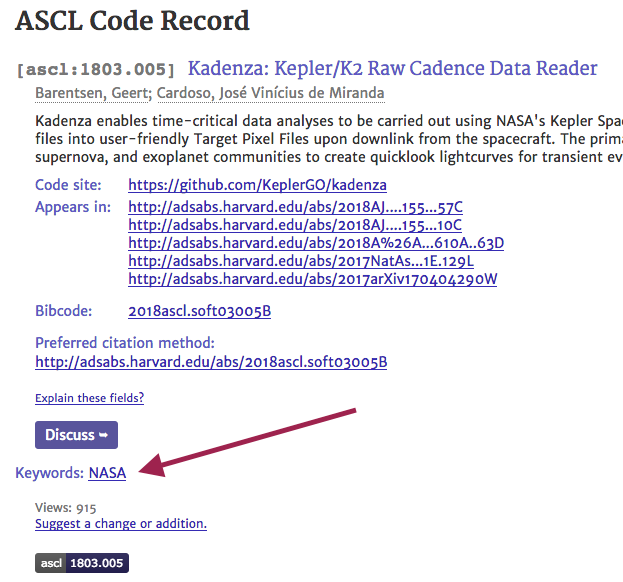 ASCL has started tagging NASA software among its entries, allowing you to search ASCL and ADS for this software. You can find the tags on an entry below the “Discuss” button. 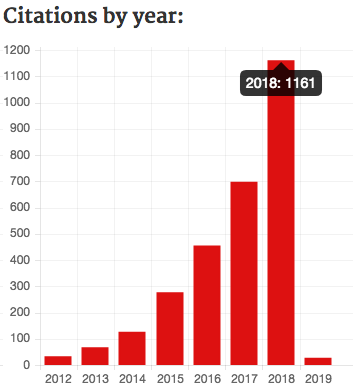 Citation information and other statistics, such as the number of site links we most recently checked, when we checked them, and how many are healthy, appear on our dashboard, which is updated on Tuesdays and Fridays. If you have any questions about citing ASCL entries, we’re happy to help! Email editor@ascl.net or tweet to @asclnet. This entry was posted in codes, news, stats on December 6, 2018 by Alice Allen. This entry was posted in code additions, codes, news on December 3, 2018 by Alice Allen. This entry was posted in code additions, codes, news on November 7, 2018 by Alice Allen. The Astronomy Department at the University of Maryland (College Park) offers a one-credit astronomy scientific computing class, ASTR 288P: Introduction to Astronomical Programming, to provide undergraduates with a foundation in computing. This course is a prerequisite to an advanced-level three-credit course on Computational Astrophysics (ASTR 415). In ASTR 288P, students learn to work with the UNIX terminal, get the basics of coding with Python and some C, and learn what makefiles are and how to install software, among other topics. The course also introduces students to the ASCL, as for the final class project, students (either alone or in pairs) pick a code from the ASCL, give a short presentation on how they installed and used it, and discuss how that code fits in the large scheme of computing in astrophysics. This allows the students to get a feel for the computational work the astro community is doing and is a good match to test the skills they should have learned in the class. This entry was posted in codes, ideas, news on October 19, 2018 by Peter. Additional changes will be coming to the ASCL in the coming months as we continue this funded work. We love this project; at its core, it’s a simple concept, and leverages existing resources (ADS, various NASA code sites, and ASCL) to make research software more discoverable and provides information about NASA software that was not readily available before. It furthers the excellent work NASA has been doing to release software, demonstrates yet another value of ADS (which has many superpowers! ), and makes the ASCL more useful, too. This entry was posted in codes, news on October 12, 2018 by Alice Allen. This entry was posted in code additions, codes, news on October 4, 2018 by Alice Allen. This entry was posted in code additions, codes, news on September 5, 2018 by Alice Allen. Page rendered in 0.465 seconds. Blog powered by WordPress.